From pension reform to airplane noise, Palo Alto's elected leaders routinely find themselves wrestling over issues over which they have no jurisdiction and little influence. The list of such issues has been growing in recent years, with the latest entries including grade separation (an under- or overpass) on the rail corridor, protection against sea-level rise and reform of a state law that allows developers of affordable housing to exceed local zoning regulations. These topics, as well as many others, make up the legislative agenda that the City Council approved last month -- a document that officials hope will help raise the city's clout in Sacramento and Washington, D.C. The semi-annual document, which the council approved on June 22, functions as a set of instructions for Palo Alto's state and federal lobbyists: the firms Townsend Public Affairs and Van Scoyoc Associates, respectively. It establishes the city's positions on various initiatives currently going through the state and federal legislative processes and flags certain legislative areas as particularly suitable for tracking and taking a stance on. "This is intended to help us both react to legislation and legislative policy that comes before us and also to help form policy as we move forward," said Richard Hackmann, a management analyst in the Office of City Manager who is coordinating the city's lobbying policies. So what exactly are the city's lobbying priorities? On the state level, reforms to Proposition 13 and to the city's pension system top the list. The city is officially supporting a proposal by state Sen. Loni Hancock, D-Berkeley, to amend Proposition 13, a landmark law that was passed by the voters in 1978 and that caps real estate taxes. Under the proposed change, property values for commercial and industrial properties would be reassessed to reflect the current market value, potentially raising billions of dollars in tax revenues for local schools and governments. Currently, reassessments only occur when a property changes hands. If Hancock's effort succeeds, the reform would be included on the November 2016 ballot. Curbing the rising pension and health care costs for city employees also remains among the highest City Council priorities. The list of strategic initiatives includes an entire section dedicated to the topic, with the city pledging support for laws that reduce cost for public employees' health care; expand its ability to offer health, welfare and wellness services for workers; and promote long-term stability of CalPERS, the state's pension fund. At the same time, the city is officially opposed to legislation that would increase medical costs; expand workers' compensation coverage for illnesses and injuries that are not work-related; or impose state-mandated training programs without offering a reimbursement to the city. During the June 22 council discussion, City Manager James Keene said it's important for Palo Alto to work with other cities to address CalPERS issues. Currently, he said, there are many regulations in place that "lock cities into some pretty stuck positions" in terms of the services they have to provide. Like other cities, he said, Palo Alto is looking for more "flexibiltiy" in this area. "One of the things we want to be doing in our legislative strategy is having some follow-up conversations about how we take it to the next level, as it relates to ongoing legislative engagements and activity and coalition building over time," Keene said. "Obviously, we won't have any success in this arena as a single city ourselves and we won't be able to accomplish anything near to what we want to accomplish in this single area." Another topic on which the city hopes to find partners around the state is opposition to the existing formula used by the Association of Bay Area Governments to allocate how much housing each community has to plan for. One of the council's top legislative strategic initiatives is to advocate for reform to the allocation process, as well as for changes to the State Density Bonus law, which gives projects with affordable-housing components density concessions (the law recently allowed a mixed-use development at 441 Page Mill Road to include more office space than the city's zoning code otherwise allows). Some of the law's elements, the city's legislative document claims, are "counterproductive to the jobs/housing imbalance." The list of legislative initiatives also includes a dozen environmental issues, including supporting energy sources that don't emit greenhouse gas; conservation pricing for refuse; a ban on Styrofoam food containers; and a requirement that cigarettes sold in California are manufactured with biodegradable cigarette butts. The latest entry in this category is an issue that has become more pressing in recent years: airplane noise. Over the past year, members of a new citizens group called Sky Posse have been lobbying the council to do something about the increasing number of planes flying over their homes at all hours of the day and night. Mayor Karen Holman pointed out at the June 22 meeting that other communities, such as Phoenix, have had "some success in terms of getting some kind of relaxation," via revised routes. But even with lobbyists' support, getting the Federal Aviation Administration (FAA) to do anything on this topic could prove difficult. Last year, the city had a tough time persuading the FAA to make revisions to its Environmental Assessment, an analysis of new flight-management practices and airplane routes. The FAA ultimately approved the document after finding that the new program would have "no impact." Keene noted in a February report that cities have "a limited role in the area of airspace and that this resource is administered by the federal government." Thus, he is relying on Van Scoyoc Associates to work on behalf of the city to address this topic. The outcome is far from certain. Steve Palmer, vice president of Van Scoyoc Associates, noted at the June 22 meeting that the FAA isn't known for quickly responding to suggestions from cities. "The FAA has a terrible 'not invented here' syndrome," Palmer said. "They are not stopping quickly to change their minds. They have to get dragged into these things." Great news! I'm glad to hear that we have some kind of avenue to fight the incessant SFO plane noise over our city. Thank you to James Keene for trying to do something about this quality of life issue for Palo Alto residents and hiring Van Scoyoc Associates to represent our city. I'm glad the city manager, whose annual compensation exceeds $430,000, is courageously enlisting lobbyists to reduce the retirement and medical benefits of the city's blue collar workers. What a hero. Then it is time to think about whether this is a good use of City funds. Or if the expert is just lining you up for a long, drawn out battle with big costs and an unlikely win - "I told you that the outcome is far from certain." In the past when Atherton and Menlo Park with the help of San Mateo County have had meetings with the FAA to complain about airplane noise over their cities, the FAA have responded by re-routing incoming flights over south Palo Alto. Unfortunately, Palo Alto is in Santa Clara County and neither our county politicians nor our City Council seem willing to fight for us. In fact City Manager Jim Keene seems to make excuses as to why our City should not respond as did Atherton, Menlo Park and San Mateo County who took the FAA on directly and got results. This is very telling. Lobbyists are unconscionably expensive. Keene should reveal just how the city intends to pay for this. This sounds like another way to spend our money for no good returns. I've had more issues with the bi-plane that was flying the Geico ad over PA this weekend. So the lobbyist going to address ABAG requirements and the city's jobs/housing imbalance. Anyone want to bet how Keene and the city will direct the lobbyist? Will they fight ABAG as other communities are doing or will they push for even higher high-density offices and "affordable" housing? Cities like San Francisco have realized that MOST of their new "affordable" housing quickly reverts to market rate after a few short years. A recent article put the figure at around 75%. Great scam for developers, not so much for the rest of us. The media, City Council and that new panel loaded with PAF members should be asking hard hard questions. Also, I notice there's nothing in there about water conservation or stopping commercial companies like Nestle from selling state water while forcing the rest of us to extreme conservation measures that only raise our rates because we're not using enough! While we're waiting for the lobbyist to do something about airplane noise. please read and complete Rep. Anna Eschoo's progress update on the noise and please fill out her Noise Abatement Survey at the link below. Will they tell the advisor on aircraft noise that the City has territory that is south of Pagemill/Oregon Expressway? Online Name - This is such great news. Thank you so much for the link. Please pass the word and have Sky Posse add it to their website. Eschoo's survey asks whether you live in: (1) an urban area, (2) a rural valley, (3) a rural area near the top of a ridge. It's telling that suburbs are a bygone concept. ResidentDN, you're welcome. Please share it widely. And those who are active in SkyPosse, please share it there, too! I have news for you. Palo Alto IS an "urban" area. It is NOT some backwater suburb. Not some rural area. Not what some people remember that is was in the 1950s. Interesting that P A is classified as an urban area. I spend quite a lot of time in San Francisco. I never have heard a jet plane over the City. It is much quieter there than it is in Palo Alto. Also, many other Great Cities in Europe are very quiet! Also, why arent all our wonderful parks (Foothill Park, Winderlich, Huddart Park and Midpeninsula Open Space parks) protected from obtrusive ,pollution generating jet planes flying to SFO? SFO is a for-profit corporation owned and operated by the City and County of San Francisco. Profits from the operations of this industrial facility (SFO) go into the City and County of San Francisco’s general fund, and the toxic waste products (noise and air pollution) are dumped on the people living in cities under the departure and arrival routes. 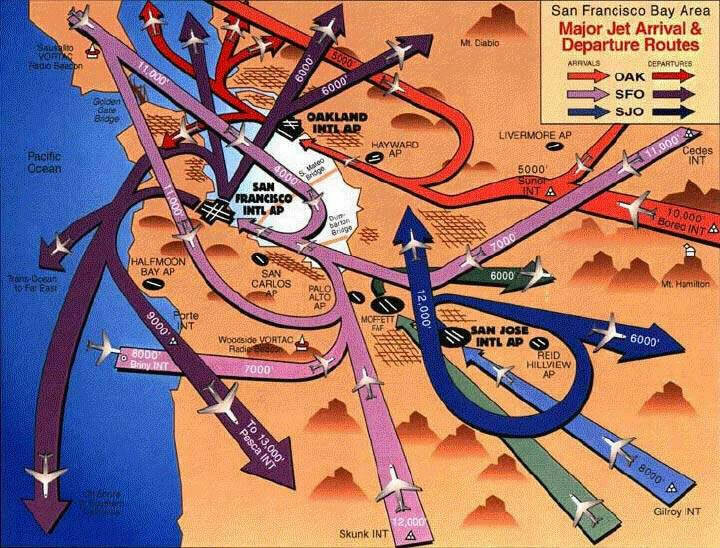 Of the nine routes into and out of SFO, only one crosses over the western-most portion of San Francisco, at over 10,000′. Bottom line... SF owns SFO. This gives SF a lot of "pull" with the FAA, and SF doesn't like noisy planes spoiling the SF experience for the tourists. SF is also one of a handful of cities that have torn down their elevated crosstown freeways. "SFO is a for-profit corporation" -- where does this assertion come from? SFO is a self-funding enterprise department of San Francisco. Some income from airport concessions goes into the general fund. Is the Palo Alto Utilities Department a for-profit corporation? Operating expenses were $625.7M, and they transferred $38.0M to the City and County of San Francisco. SFO gets a piece of everything that happens at the airport... terminal and hanger leases, landing fees, aviation services, retail concessions, parking, taxi medallions, shuttle bus service fees, etc. SFO even charge rideshare drivers for access to the airport, and compliance is enforced by SFPD! "SFO to collect fees from rideshare drivers"
Palo Alto gets a piece of everything that happens here too. Doesn't make us a for-profit corporation. Sky Posse's website loses credibility for characterizing SFO as such. Sounds like a weak effort to capitalize on liberal bias. If you are questioning the business status of SFO you can go to their web-site and click on the business data at the bottom. They are a very complicated organization that is part of the city of San Francisco. Since it is owned by the city it is not a non-profit organization. It sells bonds and has complicated contracts with it's vendors. And of course it has union participation. Go to their web-site to see how they depict their organization - it is complicated. Luckily Sky Posse simplifies it for us. Since pensions is included in this overall discussion there are a number of articles in the papers about CALPERS. So they are busy divesting stocks. Looks like they went to the top stocks in the country and picked some with the highest disbursements to stock holders. Given the overall size of these organizations they were targeted for specific actions which do not represent their overall business strategies. You have to wonder about why the city allows these political decisions to determine how cities run their overall budgets. Any shortfall will be passed on to the taxpayers. But maybe that is the intention. Some organizations enjoy a tax free status - however -if they stray into political actions then their tax free status should be taken away.